Are you on the hunt for the right headphones with good bass, but don’t want to spend a ton? Look no further! We found 10 sets of headphones that will give you the right amount of bass kick for a great price! Whether you wear them to while running or chilling at home, there is a pair out there that will give you what you need. 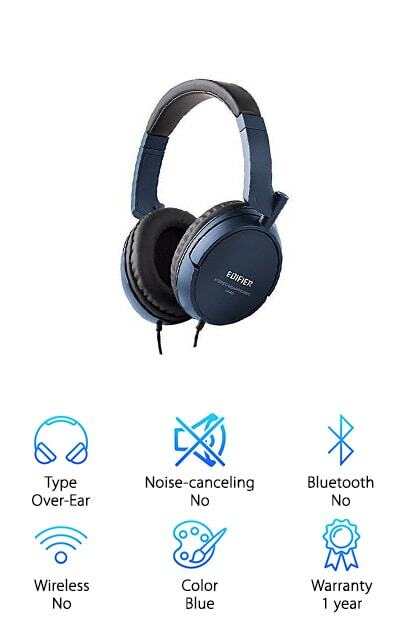 Before we get to the headphones reviews, here are a few things to consider. 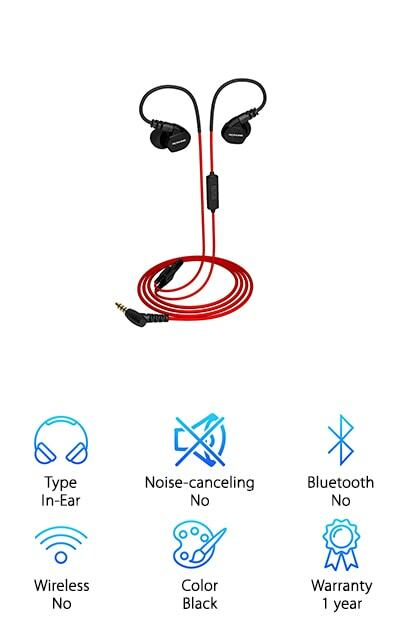 Type: There are two types of headphones: in-ear and over-ear. In-ear headphones use earbuds you place inside your ears, which stay in place while moving around. Over-ear headphones look like a traditional headband set that sit snugly over your ears. Noise-Canceling: For headphones to be considered truly “noise-canceling,” they need to use noise-canceling technology that diverts outside noise while using them. Many sets, however, come with noise-reducing plugs and pads that reduce noise, but not truly cancel outside noise entirely. 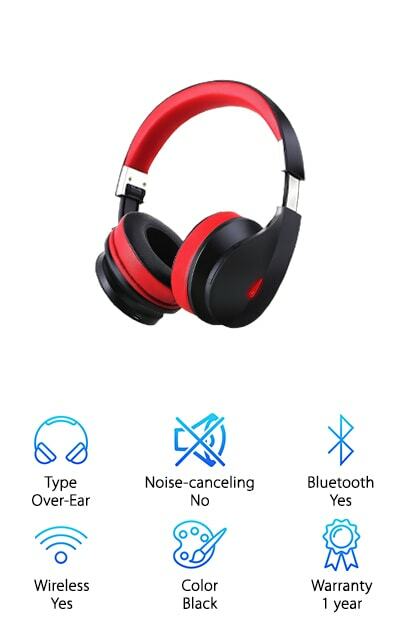 Bluetooth: If you’re buying wireless headphones, getting ones with Bluetooth mean they will be compatible with any Bluetooth-enabled device. You can sync your wireless headset to Bluetooth devices like a cell phone, tablet, television, and more for wire-free listening with ease. Wireless: Wireless headphones are convenient if you hate tangling with cords, and you have a device to sync them to. You need to keep them charged, so consider if you plan to use them while away from a charging source. Color: While most headphones come in classic black, you don’t have to be stuck with plain headphones! Many of them come in a variety of fun or sleek colors to match your device, outfit, or to stand out from the rest! Warranty: Any time you invest in electronics, note the warranty information in case something breaks or wears out. Things happen – so make sure the company you’re buying from will have your back if your headphones arrive broken or break over time! Now let’s get started! You know what to look for in a good set of headphones, and what features are available to suit your needs. We found 10 headphones sets that are great for working out, chilling out, and traveling. Even if you don’t have time to look over all 10, don’t worry! Check out our Top Pick and Budget Pick to get you started. You can always come back later to check out the rest when you have time! We went on a hunt for a pair of headphones that do it all, and COWIN came out on top as the best bass over ear headphones! The over-ear style is lightweight and comfortable. We really like that the cups rotate to fit your ears comfortably – something most over-ear headphones don’t do! The headphones produce true-to-life sound, which means you’ll get great sound and great bass! We are huge fans of the noise-canceling function for traveling – especially flying! 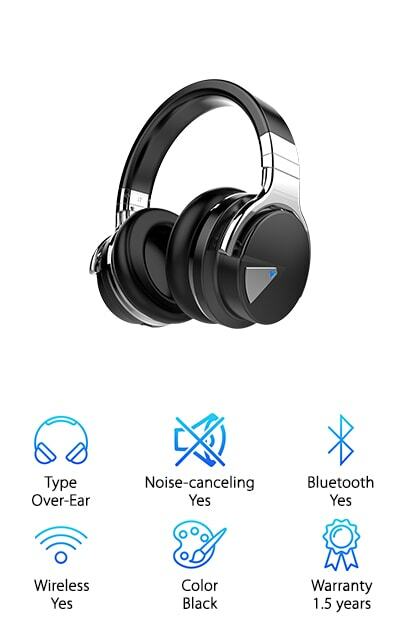 The Bluetooth wireless headphones are perfect for flying because you don’t have to fuss with wires. They pack away easily and won’t get tangled up in your bag! We also like that the battery lasts up to 30 hours, so you don’t have to charge them while traveling. The headphones we reviewed come in black, but they also come in white or red to suit your style. You can also buy a carrying case to keep them nice and protected while you travel! Looking for great sound and fit on a tight budget? 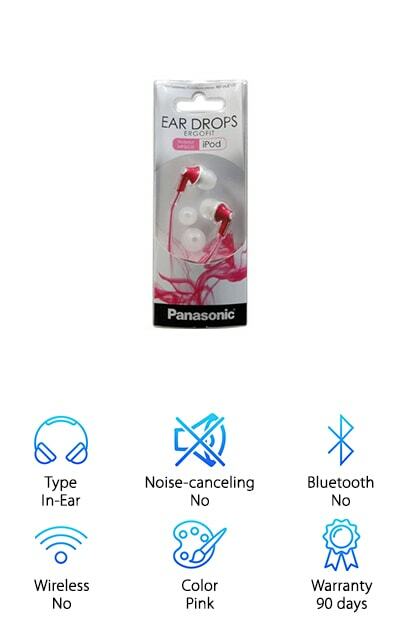 We highly recommend giving these Panasonic earphones a try – they are the best bass in ear headphones we reviewed! These may not be noise canceling earphones, but they come with 3 sizes of ear pads to get a tight but comfortable fit that will block out most outside noise. These tiny earphones produce clear, crisp sound with plenty of bass – perfect for workouts, commuting to and from work, or studying in a busy space. Since these are mainly meant to work with your phone, we like that you can buy a version that comes with a microphone to answer calls while you’re out and about! The cord length is also a plus – at 3.6 feet, it’s long enough to prevent pulling them out while running or exercising! Finally, these come in 9 different colors – with matching cords – to match your phone, outfit, or just to jazz things up a bit! 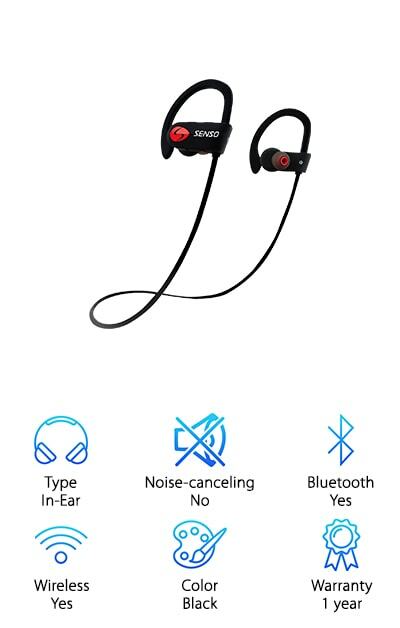 These earphones are a great option if you’d like a set of wireless earphones to wear while moving around. They work with Bluetooth to create crisp, clear, and bass-heavy sound to keep you pumped up through your workouts! The ear hooks are comfortable, and this set comes with 2 sizes of silicone earbuds to keep them in place. This keeps them comfortable and prevents them from falling out! The battery lasts for up to 8 hours, which is pretty good for such a small pair of earphones. If you want to use your earphones for hands-free calls instead, they’re great for that too! The microphone is great, and they work up to 30 feet away from your phone. You can easily talk on the phone while doing other things around the house, and they won’t lose audio quality! 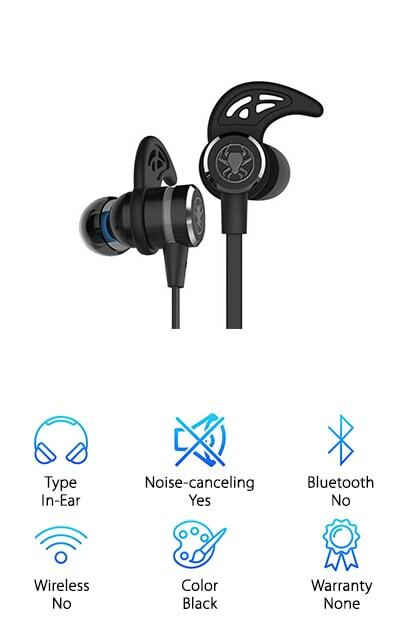 These are great if you need a versatile set of earphones you can use while traveling, working out, or chilling out! If you have small ears, you know the struggle to find headphones that stay in place while working out. 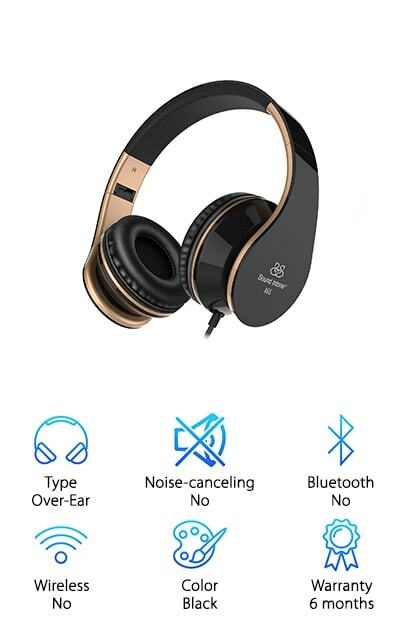 ROVKING made headphones designed with small ears in mind! The earbuds are smaller than standard designs and come with 4 different sizes of covers to find a snug fit. To keep them stable, the ear hook is built into the wiring, and you can bend it to fit your ear shape for added comfort! We like that these are made for runners, which means they won’t slip and slide while moving – even if you start sweating! The sound quality on these is amazing and will give you clear sound while listening to music or talking on the phone. The earbuds come with a microphone and allow you to control the volume, incoming calls, and playlist tracks without reaching for your phone. If you need a pair that stays put for those long runs, check these out for sure! Finding a great set of headphones on a budget is tough – especially because they usually look silly or bulky. Sound Intone’s headphones have a sleek black and gold design that will look great and perform well too! This wired headset is great for taking on your work commute, for a job, or on the plane. They come with a flat cord, which is less likely to break or tangle – a plus for throwing in your bag! We also like that they come with a microphone and controls to adjust the volume, track, stop/start a track, and answer the phone without grabbing your phone. These may not be noise-canceling headphones, but the thick, comfortable padding on the ears blocks out plenty of noise. You can enjoy listening to your favorite music, watching a movie on your tablet, or talking on the phone without all the background noise! For the price, we think they sound amazing – and look great too! On our hunt to find the best headphones for bass and sound quality, we started looking into studio-quality headphones. These headphones from Behringer are made for studio recording, so the sound quality on them needs to be top-notch! They have an ultra-wide frequency response, meaning they will pick up bass and other sounds more easily than lower quality headphones. We thought it was nice they come with the standard 1/8” connector and a 1/4” adapter, so you can use them to listen to music or record your own! They’re also incredibly comfy too! The ear pads are oval-shaped, which is ideal for keeping your whole ear covered. We also really like how well padded the headband is to keep your head from getting sore! The cord is also a major plus. It’s over 6 feet long and uses a single-side design to prevent tangling or breaking. For listening and recording, these are a great pair of headphones for the price! We think the name speaks for itself – these headphones are truly for the audiophiles out there! The sound on these is amazing, studio-quality sound that allows you to hear everything – even bass – without being out of balance. They come in 3 colors – black, blue, and white – and, depending on what you want, you can buy a pair with a microphone or no microphone.The ample ear padding and clear sound will drown out most outside noise. We also enjoy how flexible and comfortable they are. With a flexible headband, you can wear these all day without too much pressure on the top of your head! The cable is also 6 ft. long, similar to the Behringer pair, so you can easily use them in the office, at home, or in a recording studio! For a pure sound and a design that rivals even the most expensive headphones, we recommend giving these a try. Would you rather have a pair of wireless headphones? Check these out! AUSDOM created some of the best headphones for bass music, and that’s not the only reason we like them. Their full frequency design means great sound, especially if you’re listening to bass-heavy music. In addition to the great sound, these are a super comfortable pair to keep on all day! The ear pads are really cushiony, and the headband has plenty of padding to keep your head happy! They also have a decent microphone and controls to handle incoming calls, as well as control the volume and tracks while you move around. We also recommend them for your next trip! They fold easily for storage, and the battery life is up to 20 hours, which is plenty for even a long flight! If you’d rather use them as a wired headphone, no worries – it comes with a wire you can easily plug into your device or recording equipment! Another common use for headphones is gaming – and this is a great pair to use while you’re busy exploring new worlds, fighting the bad guy, or taking on a mission with friends! These headphones are made to fit any gaming device or PC, and will give you high-quality sound with plenty of bass! They come with a microphone and functions to answer/hang up calls or adjust volume. This is great because you can use these headphones as both a hands-free phone and a headset to talk with other gamers online! They also come with a set of 3 different sizes of noise-canceling ear tips, so you can drown out other background noise while playing. If you want to take them from gaming to working out, no problem! They come with clips that hold them tightly to your ears, so you can run without worrying they’ll fall out! They also come in red or green to match your console or style! The final set we researched for our headphone buying guide comes from Sarki. 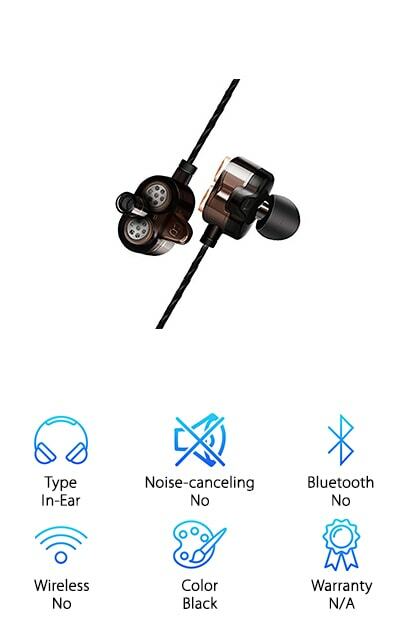 This set of earbuds is unique because each ear side comes with 2 speakers, instead of the typical 1 per side. We like that this gives you a clearer, well-rounded sound that usually only comes from studio headsets! You can truly hear every instrument clearly without having to turn them up too far. The earbud covers also come in small, medium, and large sizes to produce an effective noise canceling effect. You won’t have to deal with outside noise, and others won’t hear what you’re listening to. 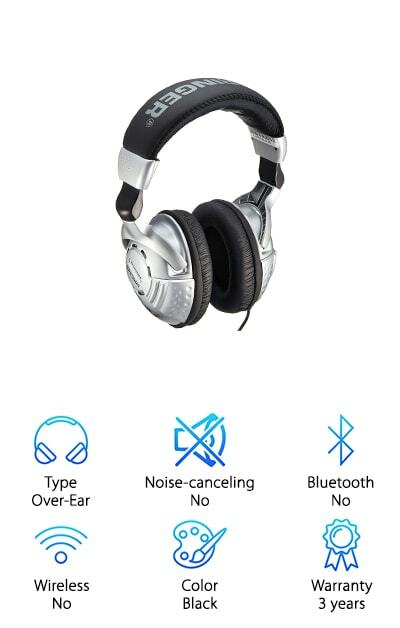 These headphones come with a microphone and controls for hands-free calling and controlling your music playlist. The cord is almost 4 feet long, which is perfect for running or exercising without worrying about pulling out your earbuds! We think these are a great looking pair of in-ear headphones that also put out a clear, crisp, beautiful sound!